Udemy is a great source for online education, not only because they offer both free and cheap courses (and some expensive ones if you fall in love), but they’re also taught by real world people, not just teachers and instructors. This can give you a really unique perspective on topics, especially if you can find courses offered by experts. Another thing I like about Udemy is that they have dozens of topics ranging from business-related to categories that are hobby-related (still a worthy investment!). Duolingo is one of my favorite sites and it blows my mind that it’s not more popular! On Duolingo, they will teach you to learn a new language, even if you have only 5 minutes a day to spare. Whether you’re doing this for your career or just a personal goal, learning a new language will do wonders for your brain and wellbeing (not to mention that it’s fun). SkillShare is similar to Udemy, but has a bit of a different feel and stricter guidelines for their course structures. 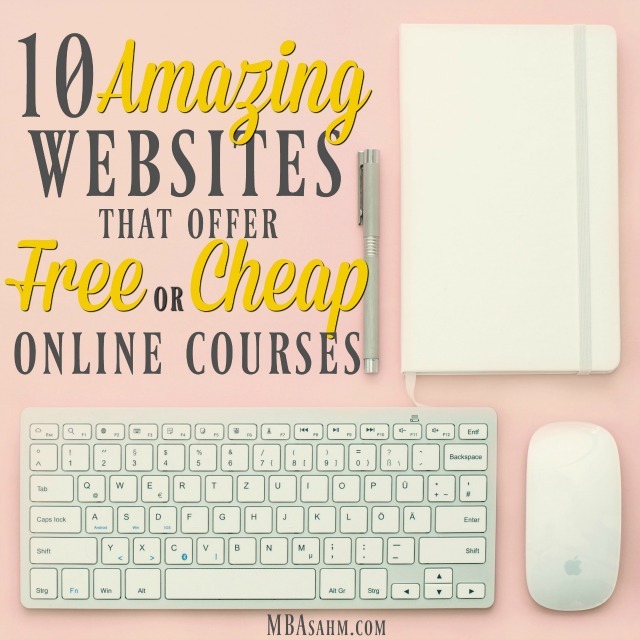 They have a ton of free courses, but also offer paid options if you are looking for something more advanced. The cost is simple and straightforward – it’s a subscription service. Depending on whether you want a monthly subscription or annual subscription, you may anywhere from $9-$15/month. Not too bad if a lot of their courses look good to you! 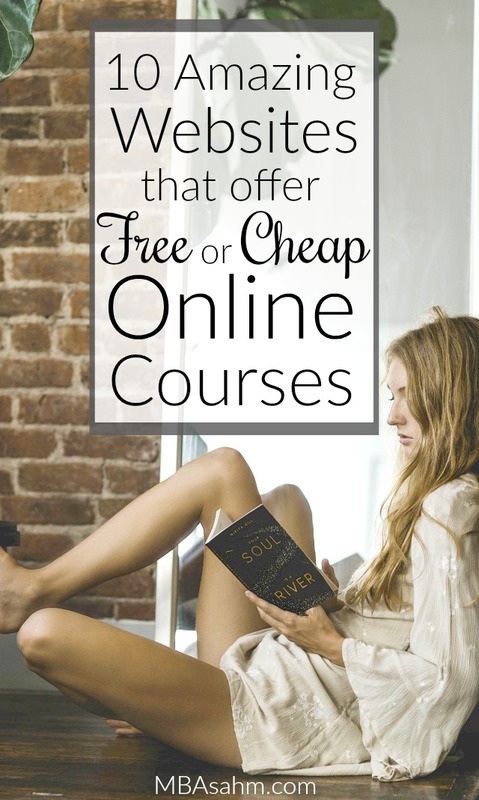 Even with the paid subscription, their courses fall into the inexpensive category. Treehouse offers a unique, niche-focused course catalog that is entirely web design and coding based. They teach you how to build a website, create an app, and even run a business. Treehouse offers a 7-free trial, then you are bumped up to their monthly subscription, which is $25/month. But considering you get access to their entire library and the content is fairly specific, it still is a pretty inexpensive deal! edX was started by Harvard and MIT…which is what makes them unique. They are one of the only free platforms that provide online courses taught by top universities. They offer a wide-range of courses and programs, so there’s something for everyone. They also offer the option for an official certificate if you want (or need) something concrete for your resume. Alison is a completely free site offering a wide-range of courses. You have the opportunity to earn their version of diplomas and certificates, which adds a fun element of accomplishment. 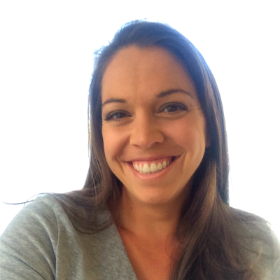 What really distinguishes Alison from the rest is their strong mission to level the playing field by offering free education to everyone regardless of their circumstances. It’s a great site with a lot of option! Khan Academy is a completely free site with an interesting twist in that they offer classes for young students as well as adult learners. The majority of the adult section is academic in nature, but they do have an entrepreneur section that includes a series of interviews with successful entrepreneurs that are definitely worth watching! If you have an iPhone, then odds are you already have the iTunes U app, even if you don’t realize it. Which is the coolest part about iTunes U…and what distinguishes it from the rest of this list. You can take these courses all on your phone! This can bring your flexibility to the next level. And they have a ton of free content, as well as some paid options (which are still cheap, with many coming in at under $5). Coursera is one of the better-known online course websites because they offer courses that are taught by top university professors. The courses range from $30-$99, so they are by far the most expensive on this list, but if you can find a great $30 course, then the quality they offer may be worth it. They also offer certificates, which can be really nice because it gives you something concrete to add to your resume. Udacity offers free and paid courses, as well as “nanodegree” programs. Their mission, which is what distinguishes them from the other platforms, is to provide free and/or affordable training that will open doors to career opportunities. 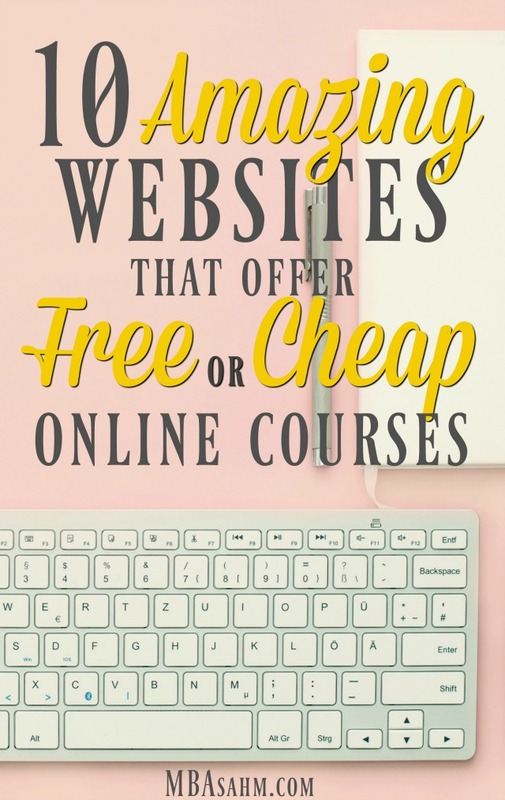 Many of their courses are built with some pretty impressive companies (like Google and Amazon), which makes the material relevant and worthwhile. I hope you get a chance to invest in yourself, if not with coursework, then with something else! If you’ve used these platforms before (or others), let me know about your experience in the comments! I’d love to hear how it went.